Troubled Brazilian airline Varig has been sold at auction to an investment group for $24m (£13m). Volo de Brasil was the sole bidder for the national carrier which has been running under bankruptcy protection. Volo, which already controls Varig's cargo business VarigLog, is expected to split the business but keep most of the routes and planes. An earlier sale to an employee group collapsed because the consortium missed a payment deadline. Volo will not inherit Varig's debt of about $3.1bn - but will have to commit to a series of payments. Once Latin America's largest flag carrier, its perilous financial situation has forced it to cancel hundreds of flights and suspend services to 10 cities, including New York and Paris. The 79-year-old airline has been subject to bankruptcy protection for more than a year. 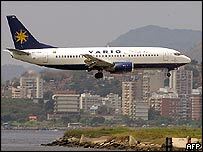 But Varig's chief executive officer, Marcelo Bottini, said: "We have shown all the doubters that Varig has a future. Today, a new Varig is reborn." Volo could axe about four-fifths of Varig's staff, according to documents lodged with auction officials, trimming the workforce from 10,000 to 2,000. The sale must now be approved by Brazil's Civil Aviation Agency.